Can we predict election results with Social Media Analytics? 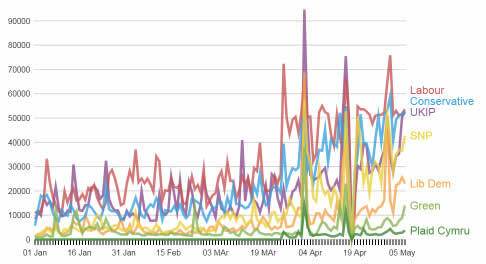 ^ Fluctuating frequency of party mentions on Twitter over a fortnight. Data from University of Warwick / ITI-CERTH (Greece) project gives this election result prediction. While trying to predict election outcomes is as old as democracy itself, in our time, unprecedented methods – Social Media Analytics – are at our disposal. This leverages one example of Big Data; the collective mass of personal expression via social media and offers a new dimensions of insights, e.g. changing sentiment over time and location and in response to events and announcements, which a poll “snapshot” cannot. It also brings challenges; the data isn’t structured, that is to say numerical and standardised: The time and geographical data are quantitative but the main data component comprises natural language (with unhelpful abbreviations, slang, expressions/idioms and monikers, like “Red Ed”). Social Media Analytics must meet these challenges competently enough to provide insight at least as reliable as a poll that adheres to statistical science. Fortunately, in recent years, Social Media Analytics technology has advanced even more rapidly than the usage and importance of Social Media itself. Even so, by the time of the last UK general election, following the “crowning of the Internet as the king of all political media”1, it had been proposed that Twitter analysis replace costly polls2. 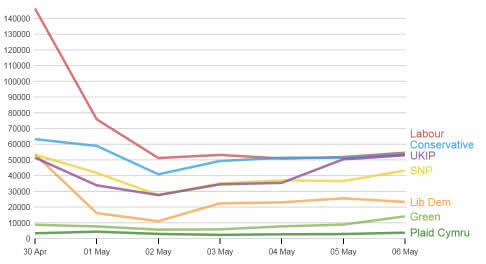 Twitter mentions of the 7 main UK political parties, 2015 year to date, above and below, the past week3. Big Data offers sophisticated insight via analytics even on the simplest level, as a statistical phenomenon, reliability through large sample size to the extent that the crudest query; number of mentions of a political party have been shown to suffice to predict an election result reliably3&4. In fairness, this study doesn’t cover a wide variety of data samples; i.e. individual national elections – and there’s only limited data about prediction via Social Media Analysis vs. actual election results. Correlations could be coincidental (Obama’s presidential campaign deliberately championed social media, which could be considered a separate fact to his win – although Romney was beating Obama in Twitter mentions approaching 2012’s US Election5) – and not guaranteed in future. However, counting the number of mentions of a party is the simplest possible ‘analysis’ – and while even that metric has been shown to carry significance, the potential sophistication of sentiment analysis isn’t limited by technology available, e.g. IBM Social Media Analytics, but can be as advanced as the user wishes to take it. Critics of Twitter’s reliability to predict elections (Tumasjan et al4) find fault with imbalanced frequency of Tweets6; let’s suppose a Labour supporter tweets more frequently than a Conservative voter. There are simple remedies to such challenges; aim to ascertain the sentiment per Twitter user rather than per Tweet. Similarly statistical principles that produce balance findings should be applied. Social Media as a data source should involve many other considerations to ensure personal sentiment is measured; quotes and statements of fact should be disregarded7. Advancing from measuring mentions this simplistic yet valuable application, Social Media Analytics connects mentions of a person, party or other brand, with positive and negative adjectives – with current technology even taking sarcasm into account. There are also contextual complexities; a favourable feeling towards a particular party or candidate will be in the context of a particular policy or discussion whether on Social Media or the national debate. However, timestamp data can be used to relate posts to wider events. It’s difficult to quantify the huge potential for the thorough and nuanced picture Social Media Analytics can provide, but one can safely predict deriving a clearer understanding of genuine sentiment from combined widespread social media users than an individual politician. Obama election ushering in first internet presidency, M. Wagner.